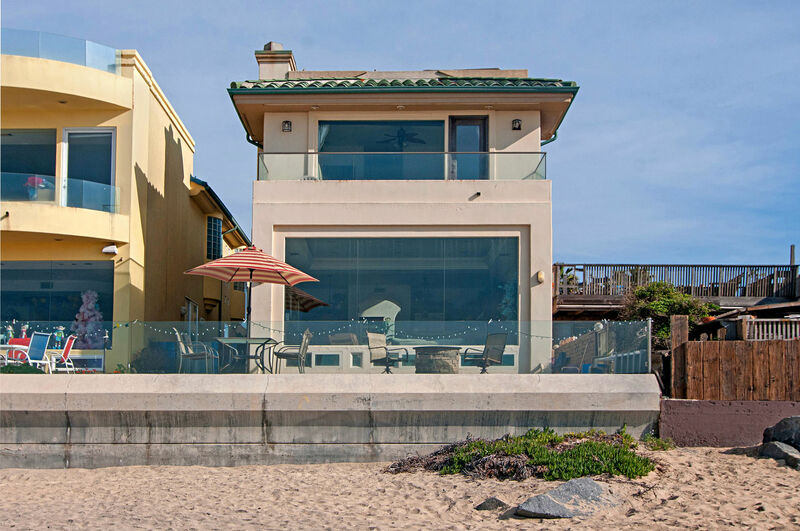 4 Bedroom/3 Bath Oceanfront House Enjoy our beautiful, spacious beachfront house, that sits on the sand as you relax and marvel at surfers on ocean waves, and look in the distance at the fishermen on Imperial Beach Pier. Enjoy breathtaking views from the patio, kitchen, dining, living room, and master bedroom. A guest writes: 'Our favorite thing was sitting on the patio with a glass of wine every evening watching the incredible sunsets!' There are four bedrooms. A guest writes' My favorite thing was falling asleep and waking up to the sounds of the waves! Another writes:'When the kids were not on the beach they were in the kids bedroom/game room playing the pinball machine. Best family vacation ever!' There is also a top roof deck. Another guest writes: The sunset view from the top deck was awesome!' From still Another Guest:'Best Family Vacation Ever: We felt at home here and will definitely be back!' Whole house air conditioning. This is strictly a weekly rental, with no daily rates. The Area Relax in a quaint beach town, stroll on the quiet beach. Walk on the old fishing pier, and bring your rod and bait! Excellent surfing! Watch or participate! A 10 minute drive affords you easy access to the famous Island of Coronado and its golf course. 25 minutes takes you to the world famous San Diego Zoo, Seaworld, San Diego Embarcadero, San Diego Convention Center, fabulous desert or mountain drives, Mexico, and all that the sophisticated city of San Diego has to offer! Awesome Week At The Beach-The views from the minute we walked in were better than advertised! We thoroughly enjoyed our week at the IB beach house. My kids, 3,4 & 6, were in the sand directly outside virtually all day, every day. Walkability was fantastic, a big plus for us. IB is a very low key beach town (which we loved) and within blocks we found multiple playgrounds, coffee shops, restaurants, a brewery, convenience stores, ice cream, the pier, and more. We definitely recommend the house and location to all. Fantastic rental home!-This was the third time my husband and I stayed in Imperial Beach. We prefer homes over condos and feel very lucky to have found this gorgeous house. The location is second-to-none offering panoramic views of the ocean. The home is very-well appointed with everything you could require. It is very comfortable, very clean, and quiet. We take long walks every day and you can go as far as you like in the neighborhood or on the beach. Ocean-front Home-The home was perfect!It is a beautiful home that feels very spacious! Being right on the beach made for a great vacation. Another incredible vacation-Once again we thoroughly enjoyed our stay at 1022 Ocean. The house is incredible as usual with the views and amenities. We are somewhat concerned with the rising rent however and hope we will be able to continue to stay here. All in all San Diego Vacations was very hospitable and helpful in helping us and we are looking forward to next year already! Waves of Memories-There are few things more relaxing than the sights and sounds of waves crashing right outside your windows. This HOME is priceless. The floorplan is perfect for family enjoyment, privacy and comfort. All of the amenities touted are real. Plus, there are great bicycle trails along the Estuary and the coast. The beach is well cared for by the Port Authority and the Lifeguards are ever present. All in all a wonderful canvas for life-long memories. Howard family vacation-The House was wonderful. Plenty of room for my whole family. The Kitchen was stocked with more than what info on internet states. great beach views from family room and all decks and patios. Close to all restaurants and IB pier. Beachfront Perfection-This beautiful, well-maintained beachfront home offers all you need for a week of Pacific sunsets, family cooking & dining, and an ocean playground. Annual IB family trip-This rental was perfect for our family. We enjoyed it and will plan on returning. The house was clean. Great Stay-Great spring break watching the waves and playing in the sand. Right on the beach.-The location of this home could not be better. Being right on the beach is what we want when we come to CA. Everything you could possibly need is in the home and we have always enjoyed our visits. The agency is nearby and is there should you have questions or any problems. We recommend this home with the highest regard. You will not be disappointed! Amazing-It was exactly as pictured. A couple bedrooms were small but a minor trade off when all other amenities are considered. The location, kitchen and master are amazing, loved it! Beautiful Home-Beautiful home. Lots of space. Loved that there was plenty of room in the living area and comfortable furniture for all of us to sit and relax. Since it was cool when we were there, we used the outdoor firepit and the indoor fire place which was great. Nice location and beautiful views. 6th time-This was our 6th time in a San Diego Vacations managed property in Imperial Beach over the last 5 years. We absolutely love staying in the house on 1022 Ocean Lane and this was our 4th time there. 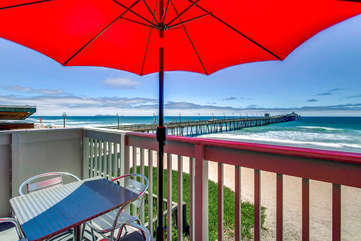 It has the best views on the beach with the roof deck and the amenities & space are very comfortable. We are looking forward to next year already! Can't get any better-This home is perfect! 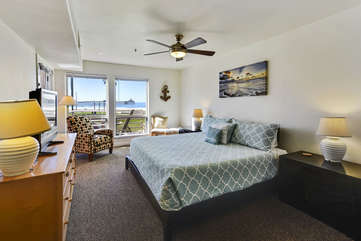 Right on the beach and very spacious with all the comforts of home! Looking forward to next year!